Yes, I color coordinate. Can't help it. Ok, so, yeah.. what depresses me.. I can only wear maybe 40% of my closet at present. Today my mom took a picture of me and it was the old -- More Chins than a Chinese phonebook -- type of picture. I really honest to God had no idea I looked that way!! I've been real good about eating lately. Ok, good, not "real" good. I have cut back a lot on portion sizes, but I could probably make healthier choices. Working out? Eh. Sometimes. I just bought 4 pairs of pants. Fall pants. I want to fit into them before the season changes! See, I'm in between sizes right now. The size pants I bought, I just kinda fit in them, but to go up that would be too baggy, aside from which - who wants to buy pants in a bigger size when you're losing weight? That's my current goal. I'm not that far from it. The pants fit if I don't mind bulges and muffin top, which I do mind thank you. 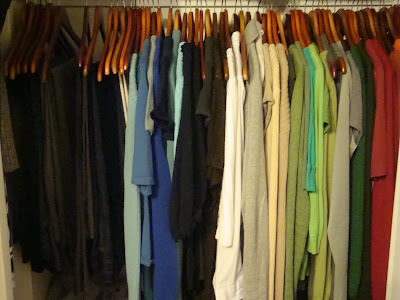 There are 11 weeks left this year, if I lose the healthy 2 pounds a week each week, I should be able to lose 22 pounds and fit into about 60% percent of my closet. Not a whole lot more, but a good start, and enough to fit in my new fall pants. I have taken my "Before" pictures, which I am too ashamed to share. If after losing my goal of 50 pounds, I am feeling bold, maybe, maybe, maybe then I'll share what I came from. I don't know how to work a button yet, but click on the words above to go to link. And what the diggy to not knowing, but I'm still learning ol blogspot here. If you're like me and need to lose, join the bloggerhood!! I'm a 31 year old college student, and now that I've been going to school during the day, it's mostly with students 10-12 years younger than me. And may I just say. I was around when this was popular, and you should not be bringing it back. It's wrong. I mean, WRONG. Please pass word. Unless you are dressing up for Halloween - No-no. No. NO. I witnessed this trend on several of the girls at school and chuckle to myself. I hope it's to myself anyway, chances are good that my non-poker face is showing my laugh at their expense. Just today, I saw a girl wearing flourescent yellow jeans, a matching t-shirt in the yellow, but with hot pink scribbles on it (! ), flourescent orange belt, with clear jelly shoes. I tried shamelessly to take a picture, but it didn't turn out. I was trying to be inconspicuous but my camera phone wasn't fast enough. Yesterday we celebrated Canadian Thankgiving and I have some FABULOUS recipes to share. I didn't take any pictures so I have to wait for my aunt to get home and email me them. Super duper fantastic Thanksgiving recipes coming soon!! i color coordinate too... :) you're not alone :OP.. good to hear the thanksgiving day went well :)! !